Richard is highly qualified, with over thirty years of experience his focus is on closely held business owners as well as individuals in the areas of estate planning, business continuation, retirement planning and the senior market. “Our clients are always growing,” Hoover said. “The partnership with my son Darrick enables us to keep pace with our clients’ growing needs through a much broader circle of services. 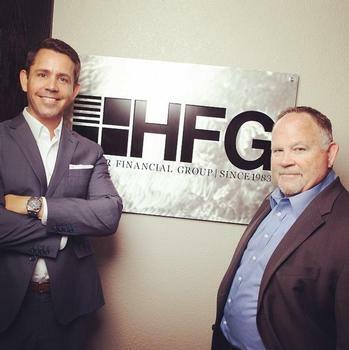 Darrick entered HFG with a strong educational background in finance and economics. Darrick brought a new twist into the firm with his strengths in wealth accumulation strategies, asset allocation and retirement planning. His focus is with entrepreneurs, business owners and physicians. Darrick says, "That people do not plan to fail, they simply fail to plan. No matter what your tax bracket is HFG can help." Being a leader in the insurance and financial services industry means continually striving for improvement. To keep pace with clients' needs, Hoover Financial Group has access to new products, enhanced product features, expanded quality service, and pioneered new technologies. Breaking new ground is part of our tradition.